With ethics and corruption charges felling leaders in Congress, it might be informative to take a look at the less-than-respectable sources of campaign financing in Arizona's crop of Congressional races. The bottom of a dirty money barrel has got to be the criminal lobbyist Jack Abramoff. 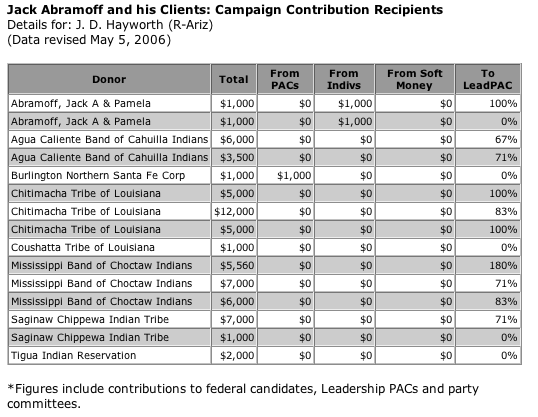 Surely, no one in Arizona took money from Abramoff's many-tentacled lobbying operation? Well, think again. In fact, one of the largest recipients of Abramoff's money was our own J.D. Hayworth of CD 5. In fact Hayworth accepted over $64,000 from Abramoff, and his clients at Abramoff's direction. But for Hayworth, the fun doesn't end there. The rabbitt hole goes much deeper. Of the $64K taken by Hayworth, over 80% of that money when to Hayworth's own TEAM PAC, a leadership committee set up by Hayworth to raise money for his legislative allies. "Between 2001 and 2005 inclusive, Mary Hayworth, J.D. Hayworth's wife, received $101,872 compensation from her husband's leadership PAC, TEAM. During the same period, TEAM PAC also paid outside sources for bookkeeping and political consultation/fundraising a total of $61,676. In the period between 2001 and February 2006, inclusive, TEAM PAC took in $538,109. This puts administrative costs for TEAM PAC at around 30% of contributions over a five year period." So, not only did Abramoff money flow to Hayworth, most of went to TEAM PAC, and over $100K of TEAM PAC's funding went into the Hayworth's personal accounts. Not only was Hayworth taking money from Abramoff, Abramoff was practially paying his wife's salary. A lot of politicians have returned Abramoff's dirty money, wanting to avoid even the appearance of impropriety. Not J.D. and Mary. They're keeping every nickel. And why not, if there really was impropriety, why would they renounce the wages of sin? God bless, em. I suspect they'll need that money when voters send J.D. back into broadcasting. The more you know about college loans before you actually need student loans the better prepared you will be to finance your personal student loans properly as well as know if you can get some Arizona student loans to help cover your costs. Could you please check out what The Ft. McDowell Indian Reservation inside of CD5 asked Abramoff to do for them.? Follow "THE MONEY!" I'd be willing to be that it had something to do with protecting the Ft. McDowell tribe's casino. If Abramoff is true to form, he would be lobbying to prevent other tribes in Maricopa county or nearby areas from opening new casinos, or expanding existing ones. question, is j d on anobolic steroids? - he looks like he is. Let's all revel in the fact that we now have an extremely qualified and honest gentleman representing our 5th District in the United States House of Representatives ~ Harry Mitchell. He will do an outstanding job for us and gain the respect of his colleagues - something that Mr. Hayworth never did.